Multiple terror attacks this weekend, including a soccer game bombing in Istanbul, a church bombing in Cairo, a car bombing in Mogadishu, and a suicide bombing in Yemen. We'll look at the Cairo bombing because the time of the event has been reported, but it's pretty much the same formula for all the events. 1. Pallas novile Pluto and ruled by Saturn which is parallel Pluto. 2. 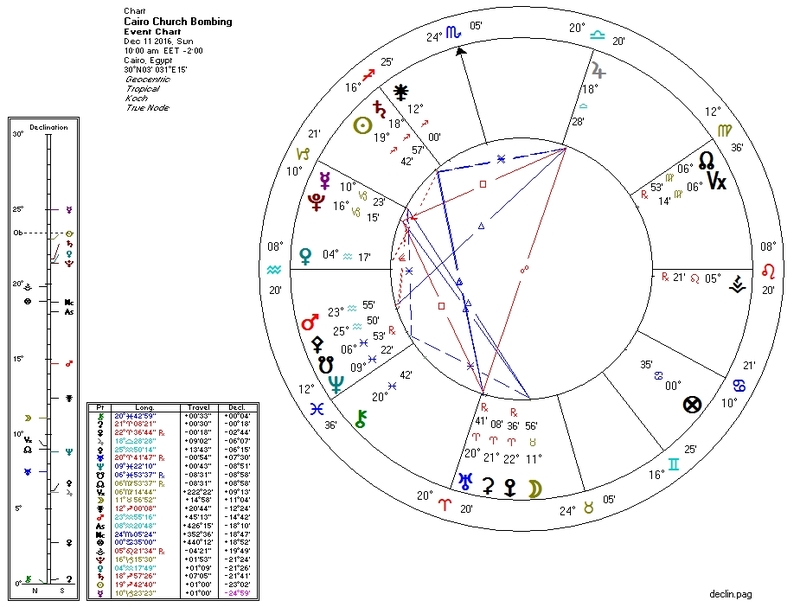 Venus undecile South Node, decile Neptune, and ruled by Uranus which is novile Neptune. 3. Venus ruled by Saturn which is square Pluto. 5. Sun ruled by Jupiter which is square Pluto. The trigger here is the combination of the Moon aspecting Pluto, and the minor aspects from Venus to the South Node and Neptune. Those minor aspects add up.